Shortlisted for the Architectural Review’s global 2017 Emerging Architecture prize, Red House is a speculative new build end-of-terrace house on an awkward urban site in East Dulwich, south London designed by 31/44 Architects for their client Arrant Land. Built on a small brownfield plot formerly occupied by a double garage and yard at the end of typical London Victorian terrace, the brief called for a contemporary design that would defy convention but successfully terminate the terrace and provide contemporary living accommodation. 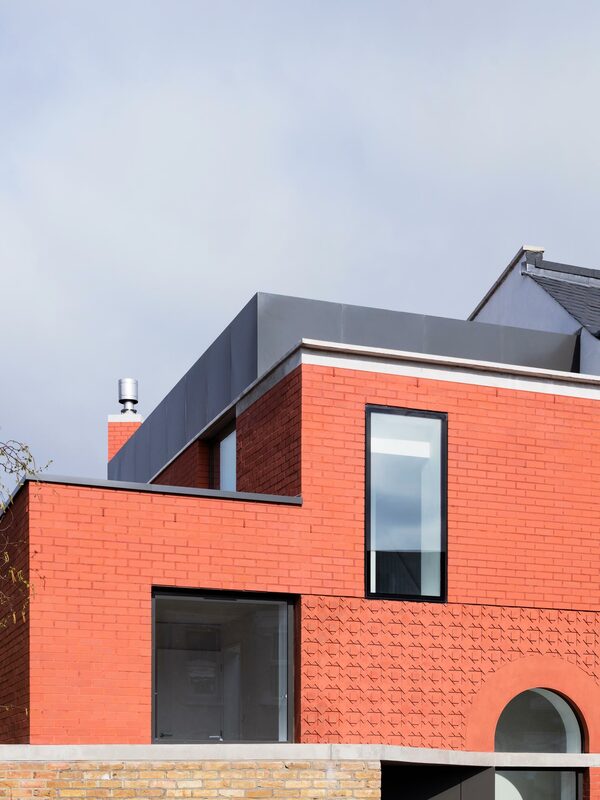 Red House takes its name from the warm red brick, which is evident as a highlight brick in the existing terrace but used here as the main building material to create impact. The building’s design addresses the complex geometry imposed by the kink in the road and the angled flank of the adjacent house. The principal architectural move on the main elevation was to appropriate the arched entrance of the terrace into a large window onto a double height hallway. 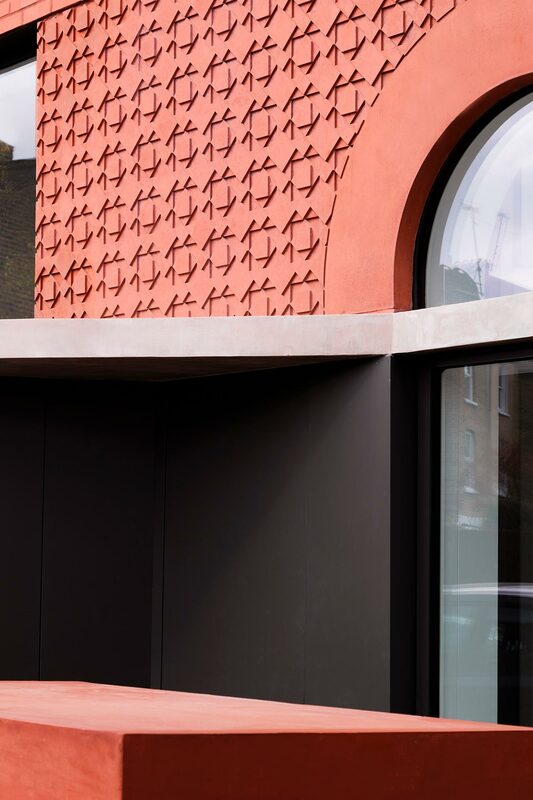 The window is frameless, the arch is stripped of detail and the span achieved with a pre-cast pigmented concrete panel, patterned to echo the decorative tiling of the floor thresholds in the entrances of the existing terrace. As the design evolved it survived inevitable negotiation at planning and the challenges of construction. The resulting design achieves 137 sqm of space on a small plot achieved by lowering the ground floor and creating a split- level three- storey house in the space of the conventional two-storeys of its neighbours in the terrace. In plan the unconventional ground floor is then “pushed and pulled “, creating a series of inter connected spaces interspersed with courtyards that bring daylight and greenery into the plan. 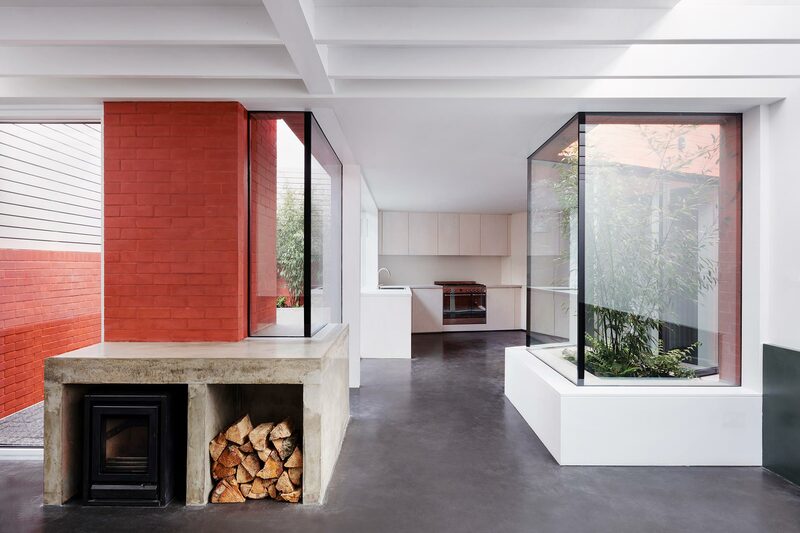 Other key featured include a wood burning stove housed with a chimney, whose red brick stack rises beyond the roofline, and a top- lit oak staircase that rises through the double height entrance. The upper floors are light and minimal, the stair sweeping through the house offering views to the Victorian terraces the house adjoins and references. The ground floor provides a rich and private suite of rooms for living, bathed in natural light, but away from the neighbour’s prying eyes. A sanctuary for the occupants to enjoy the weather and changing seasons. 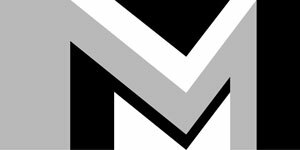 As a practice 31/44 Architects share Arrant Land’s vision to create carefully crafted and detailed homes – realising the untapped potential of difficult sites, responsibly densifying the city whilst providing contemporary homes that meet modern lifestyle aspirations. Red House evidences what can be achieved when a speculative developer permits the architect to defy conventional practice and test ideas to achieve something quite unusual. Here Arrant Land understood that the successful delivery of an idea of this potency required every decision to be considered and appreciated in the widest context, rather than as individual choices to be weighed and costed.